The Verizon IndyCar Series has unveiled its revised car design that is to be introduced for the 2018 racing season. Chevrolet and Honda will continue as the sole engine suppliers for 2018, however it’s so far not clear if chassis supplier Dallara will also continue its partnership with the series. Next year also see the departure of the Chevrolet and Honda-designed aero kits, with a standardized aerodynamics kit being used instead. 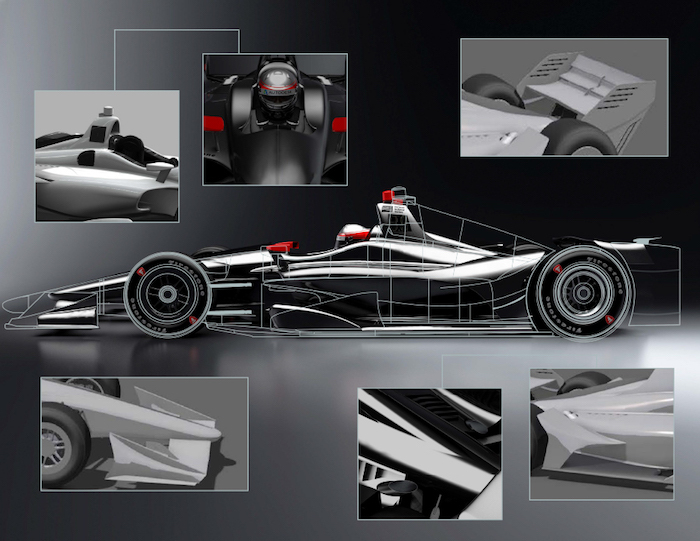 The new chassis will rely more on underbody downforce than the current car, which will make for better racing and get rid of the ugly segmented wings and fins that are currently seen on both the Chevy and Honda cars. “We’re working on creating more of the downforce from the underwing. The hole in the floor (of the undertray on this year’s car) will be sealed for the road courses and short ovals, but will still be open for the superspeedways,” Belli said, referencing the need for more downforce on road courses and less on super speedways. The new cars will not only look better and provide better and make for improved racing, but will also be much safer. Belli said IndyCar has so far achieved “97 percent” of its goals with the new chassis and will bring that to 100 percent once it hits the track for testing this summer. Would like to see more articles like this on GMA too. Less Chevrolet on the outside front row… Cadillac qualifies 2nd and fourth… Ford driver wins after Chevy driver’s lug nuts come off… stuff. In other words, summarize results and give us more tech. Please. I can certainly do that! Yes there is enough GM racing news that is available to you that many here would love to read. Things about the cars and teams that are non NASCAR are often very interesting. Also might want to keep on Pratt and Miller as they should be well into the work on the C8R. I would also watch Stevenson Racing on the Camaro and the ATS Cadillacs even more. Heck even NHRA is mostly Chevy and the Pro Stockers are almost all Camaro’s now. The Trans Am series is also well under reported and some of the best stories in racing. I know some people on these teams and they are wishing people would tell their story. I am sure if you contact them they would be more than happy to share what is going on. But I would watch for all you can get on Pratt and Miller and the C8R as this will be a major event. Mid Engine Corvette vs Ford GT? That is a reporters dream. Scott3 is spot on. The Pratt & Miller / GM effort in IMSA is the finest display of commitment and excellence in racing today. The GTE competition is fierce and highly entertaining. Last years results with the C7R was amazing. Any news on the C8 / C8R would be greatly appreciated. I have NEVER liked spec series racing. Just put a set of rules out there and let the builders and drivers come. The peak of open wheel racing in the US to me was from the mid 60’s to late 80’s with the 70’s seeing the greatest variety. I mean come on, Gas and Ethanol, 4 cylinder, 6 and 8, turbo and normally aspirated all running at the same time! It was awesome. Who remembers the guy who built the 355 SBC he found in a school bus chassis and made the race and was very competitive. Those were the days my friends! I would agree with you but for some reason the networks and fans don’t like it when one team, car, or manufacturer wins every weekend. I personally think that if everybody is playing by a certain set of rules and one team builds a better car and wins every race then so be it! I also don’t like balance of power racing either!